A mathematics teacher identified as Madam Enyonam has set the internet agog with her determination, selflessness and ability to empower children despite her disability. A hashtag that was started on Twitter, has led to the discovery of a female mathematics teacher, teaching her students by writing with her teeth because apparently, she had no arms. 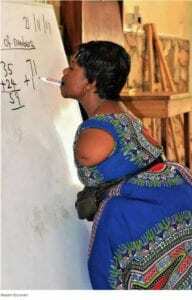 A photo showed the picture of the teacher, believed to be called Madam Enyonam, teaching math without her arms – because she had none. It is reported that she is a teacher at R/C Addo-Agyiri School. It cannot be however ascertained if she is still a teacher in the school. A hashtag which was started on Twitter, ‘#GhanaTrueHero’ sought to celebrate Ghanaians who were in one way or another, doing things for the greater good without considering the lengths they had to go to achieve their aim. The photo, ever since it was posted, has won the hearts of many Ghanaians who were in awe and were amazed at the selflessness of the female teacher. 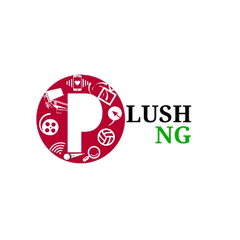 It can be recalled that just a few weeks ago, an ICT teacher, Owura Kwadwo Hottish, teaching his students without a computer went viral on social media and his heroism was shared around the world on many international news sites. The ICT teacher, not too long ago, received the very first donation of a laptop from Leeds University. ICT giant, Microsoft has also promised to ‘kit out’ the ICT teacher to help him teacher ‘better’.